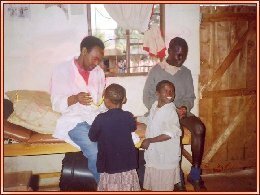 Before 2004, the school used to employ a physiotherapist, as there are many children with physical problems that need regular treatment. Unfortunately the governors could no longer afford to pay him, so had to “let him go”. 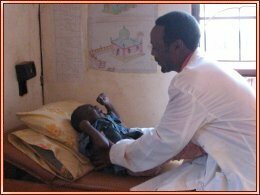 While Jean was visiting the school in the summer of 2004, she met a prospective employee, George Ndirangu, and agreed that some of the money collected from friends and colleagues before the visit could be used to take him on as a physiotherapist. During their visit in April 2007, Jean and Tina saw the small resource room and George working with Erick Wambulwa, just one of over twenty children with a variety of disabilities that George helps. Erick has a condition known as microcephally, which means he has an abnormally small head and underdeveloped brain. We were therefore prepared to see a small child, but for a four year old, he was tiny. It is recognised that the room used at present is too small and more equipment is desperately needed. There are plans to build a larger resource centre containing a room for physiotherapy, an office, a clinic and some small rooms to be used for individual or small-group work with some of the children with special needs. 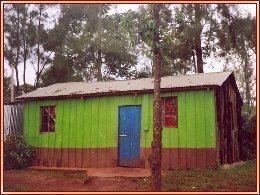 The charity continues to pay George’s salary and hopes to be able to help with the building project, as this is an essential part of the work of the school.